Radd Hard-Heart is a Nord master-at-arms and Knight Protector for the Imperial Legion at Moonmoth Legion Fort. He is one of the quest providers for the Legion, and has a number of duties for you. He also provides medium training in Axe, Blunt Weapon, and Long Blade for higher ranked members of the Legion. Radd wears an Imperial Templar Knight cuirass and a common shirt with matching pants, shoes, and ring. In combat, he relies on an Imperial broadsword. Aside from his natural resistance to shock, immunity to frost, ability to shield himself, and a natural frost damage spell, he knows no spells. "Have you found the scrap metal?" "Report on Jocien Ancois, %PCRank." "What's the situation with Dandsa?" "Have you killed the breeding netch?" "Report on Sorkvild the Raven, %PCRank." "Like I said, there's a pair of breeding netch north of Gnaar Mok. Kill them before they wander back into town again and report back to me." "So the Netch are dead? Good work, %PCName." "You already killed the Netch, %PCName." "You've been expelled, but maybe you can join the Imperial Legion again." "It's a village in the Azura's Coast region. Here, I'll mark it on your map." "She is being held captive in Abernanit, a cave on an island southeast of Gnaar Mok. Find her and get her out alive." "You rescued Dandsa? I'm glad to hear it, %PCName." "You said you rescued her already..."
"Dandsa is dead? No, I don't want to hear your excuses. Just get out of my sight." "Gnaar Mok is a tiny island fishing village in the Bitter Coast region of western Vvardenfell." "Jocien has been trying to teach the Erabenimsun of Imperial culture and virtue, but some Ashlanders do not appreciate his efforts. He was at the Erabenimsun camp, but was taken from there. Go find Jocien, deal with his captors, make sure he is safe, and report back to me." "You rescued Jocien? Good. Now he can continue his good works here in Vvardenfell." "He's dead? This is horrible." "The Buoyant Armigers have challenged us to a hunt. Go kill a Dwemer Centurion and bring me the scrap metal." "I need a %PCRank to rescue the hermit Jocien Ancois." "Go to Abernanit and rescue the Imperial citizen Dandsa." "Go to Gnaar Mok and kill the pair of breeding netch that threaten the town." "There's a necromancer up near Dagon Fel who calls himself Sorkvild the Raven." "I have no more orders to give you. Speak with the Knight Protectors in the other Legion forts." "I am at your service, %PCName." "The Ordinators have challenged us to a hunt. They claim they will bring in the skin of a Corprus beast. We will do them one better by bringing in the scrap metal from a Dwemer centurion. The only Dwemer ruins I know of near here is Arkngthand, just to the north. But I hear it's been overrun by bandits." "Do you have the scrap metal?" "Well? Where did you put it? I don't see any scrap metal." "Yes, excellent. As you've guaranteed our victory over the Ordinators, I should probably give you a little something for your trouble. Here's 500 drakes." "Then go to a Dwemer ruin and find some. We will lose by default if we have nothing to show." "You already brought me some scrap metal." "The Dunmer despise necromancy. I can't say I like it much myself. 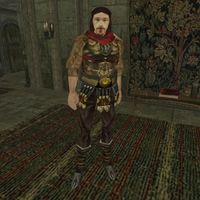 We must prove to the Dunmer of Vvardenfell that the Imperial Legion is the first to root out necromancers wherever they try to hide. Find Sorkvild the Raven near Dagon Fel and kill him." "Sorkvild the Raven is dead? Good work, %PCName." "You took care of that necromancer." According to The Morrowind Prophecies, he is Sjoring Hard-Heart's brother. This page was last modified on 2 February 2018, at 19:31.